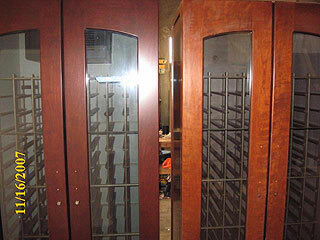 This clean, contemporary design has hardwood doors and gently arched windows perfect to showcase fine wine collections. The Wine Storage Series is designed for the serious wine collector who needs a wine cabinet that can withstand a more challenging storage environment, but still wants a stylish, high-quality wine cabinet. 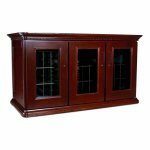 BILD wine cabinets offer superior quality and features at a fraction of the price. Offered in various sizes including walk-in wine rooms, single-deep and double-deep configurations, BILD wine cabinets feature efficient wine racks and advanced CellarPro cooling system with full 5-year warranty coverage. Please note: This line of wine cabinets are NOT made of wood. Top-vent exhaust to allow the cabinet to sit flush against the wall. All Le Cache Credenza cabinets have a back vent exhaust and therefore requires 3" clearance at the back. Other Le Cache Options including Carpet Board, Display Cradle, Alarm Relay and more. 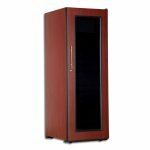 BILD Wine Cabinets - Offers the Cellar Pro cooling unit within these economical "you build" cabinets. BILD are melamine exterior finish with choice of color. 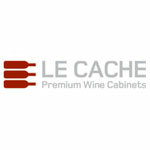 Le Cache Wine Cabinets are readily available for shipment to destinations in the USA, Canada and internationally.